I was informed that I should have a page about my Press Releases and Reviews, so fans won’t have to rely on amazon.com and my Facebook Fan Page (http://tinyurl.com/Author-Sherrill-S-Cannon ) to find out what others think about my books. So here is the information in the form of links to specific sites. The Magic Word, written by educator Sherrill Cannon, is an excellent story to share with children of all ages. The rhyme pattern consistent throughout the book creates a pleasant, enjoyable, and easy to read experience for the reader. The illustrations are child friendly and engaging, which allow children to make a real life connection. Everyone will learn the magic word instantly and will share this story and lesson with their friends in and out of school. Cute Review from MD Book Reviews – from Mother and Son this time! Two nice reviews from Great Minds Think Aloud for Gimme-Jimmy and Peter and the Whimper-Whineys. I put the Peter one on the main page, so here is the one about Gimme-Jimmy. Review: Delightful, adorable and hilarious. When little Jimmy Alexander is warned by his father that his unwillingness to share and his inability to politely ask for things will eventually cause him trouble, he refuses to listen. Until, of course, he realizes that every time he says the word ‘gimme’ his hand grows. Before long his hand is practically dragging along the floor and he begins to realize that he must change his ways before it is too late. Sherrill S. Cannon’s books have a fantastic way of telling a story in such a vivid and imaginative way that children will not only learn good morals from her books, but will want to read them and have them read to them, time and time again. If you are looking for the best possible story books for your child or grandchildren you must look for her books! I have fallen in love with them all and I know you will too! Review: Yet another fantastic winner of a book from Sherrill S. Cannon. Her stories are written in such a way that children will not only learn from them but love them! Peter and the Whimper Whineys is a beautiful, adventurous and colorful book that retells a timeless story once told by Sherrill’s own mother. The dedication is beautiful and makes us realize just how very special mothers are. This story teaches children that whining constantly is not only unattractive but can have some very serious repercussions in a cute delightful, light-hearted way that will have them smiling but also teach them a valuable lesson. Sherrill S. Cannon, I cannot praise you enough for your amazing ability to turn phrase into a whimsical wonderland that children will adore. These books are destined to become a classic in any home. Sherrill S. Cannon is a modern-day Dr. Seuss! I adore her and LOVE her books! 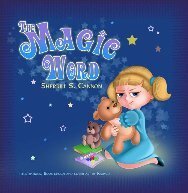 “The Magic Word” by Sherrill Cannon is an adorable children’s book that helps teach the importance of manners. Following a fun and creative rhyming scheme, the book flows smoothly and effectively teaches the magic words “thank you” and “please.” Kids will relate to the characters and will want to read it again and again. I really enjoyed it! Sherrill would you tell us a little about yourself before we discuss your books? I am a mother of four and a grandmother of nine. I have written three published children’s books, as well as four published musical plays for elementary school children. I will have a fourth children’s book released in early 2012. A former teacher, I have had varied careers including Varsity Coach, professional Newspaper Sports Photographer and Columnist, Dinner Theatre Company Stage Manager, Talent Manager, and Business Administrator. My husband and I celebrated our 51th wedding anniversary in June! We are now retired, and we travel in our RV from the east coast to the west coast each year to spend time with our children and grandchildren… sharing my books along the way! Tell us about the genre of your work. My children’s books are all in rhyme and meter – anapestic tetrameter – and are written to be read to small children. Older children enjoy reading them too! I have always loved poetry and started writing lyrical poems when I was about 4 years old (my mother wrote them down for me.) I feel that children love the music of the words, and they find it easy to remember rhymes. I also love to teach, and all my books try to teach something like good manners and caring for others. This genre chose me! What are some of your books, stories that have been published? · The Magic Word, recipient of a 2011 Gold Readers Favorite Award, a 2011 NABE Pinnacle Achievement Award, and a 2011 Global eBook Finalist Award. · Peter and the Whimper-Whineys, recipient of a 2011 Bronze Readers Favorite Award and also a 2011 USA Best Books Finalist Award. They are all available in softcover as well as eBook. What ages do you direct your books? My books are best for ages 3-8. My plays are written for elementary school classroom students, grades 1-4. Would you tell us more about your books? Santa’s Birthday Gift includes Santa in the Christmas story. (After reading a story of the nativity to my granddaughter, she had asked, “But where’s Santa?”) Santa’s gift to Jesus is his promise to bring gifts each year on Christmas to celebrate the Christ Child’s birthday. Peter is a small rabbit who does nothing but whine. His mother warns him that if he can’t stop whining he might have to go live with the Whimper-Whineys. Peter’s nocturnal adventures convince him that Whimper-Whineyland is not a fun place to be, that the Whimper-Whineys are very ill-mannered and rude, and that his mother was right…if only he can find his way home! Elisabeth was rude, selfish and demanding and had very few friends. Her mother warned her that she needed to improve her manners and suggested she use the magic word “Please”. When Elisabeth went to school the next day, she thought of her mother’s advice, “What is the magic word?” and she started saying “Please” and also “Thank You”. She tried to become more thoughtful of others, and discovered that she was a much happier person. My newest book, now in Illustration, is Gimme-Jimmy. It should be released this fall. James Alexander’s nickname was Gimme-Jimmy because he was so greedy and selfish. Imagine Jimmy’s concern when he discovered that every time he said the word “Gimme”, his hand grew larger. Jimmy was happy to discover that when he was polite and said “Please” and “Thank you”, his hand began to shrink. He started practicing his new “Polite Rule” and found out that it was much more fun to share. Do your books have a teaching objective? If so, what is it? All my books strive to teach consideration for others, good manners and giving. How do you come up with the names of places and characters in your books? Most of my characters have names that best fit the rhyme and rhythm of the story – and quite a few of them are family names. Is there a unique character or a recurring character if you have more than one published or to be published book? No recurring characters – just recurring characteristics! Good manners and thoughtfulness need to be taught at an early age! And of course they are all written in rhyme! What is your favorite thing about your book/s? My favorite thing is being able to read them to children (which makes book-signings so much more fun) and the way so many small children seem to be able to remember many of the lines…which I hope they take to heart! Is your book illustrated? If so, would you tell us by whom, and if you worked with an illustrator, can you discuss that experience? How is writing in the genre you write, different than other genre? My children’s books, because they are in rhyme, are more like poetry in many ways. And I have always loved poetry, so they are fun for me to write. Are there any problems in getting children’s’ books published? I sent out a few queries when I was working, but it wasn’t until I retired that I had time to pursue getting my books published. I sent the manuscript of Santa’s Birthday Gift electronically to the Writer’s Literary Group, who suggested I submit it to the Strategic Book Group – and now I have three published books and another on the way. Why and when did you begin writing? As mentioned earlier, my mother tells me I was writing poetry at age 4. I have always loved to write, but now I have time to do it! Whenever… Actually, a lot of “lines” pop into my head in the middle of the night, so I have a tablet and pen beside my bed so I can write them down. What projects are you working on now, or plan for the future? What kind of advice or tips to you have for someone who wants to write and get published? I whole-heartedly recommend my publisher, Strategic Book Group, to anyone who wishes to get started and not spend a lot of time writing queries to publishers who respond (if at all) by telling you to get an agent – or trying to find an agent who tells you they only accept published authors! Also, it’s really important to determine the right niche for your book, so you will be able to focus your efforts on productive marketing. Are there any other comments, advice or tips that you would give to beginning writers? Just be sure that anything you decide to submit anywhere is edited to the best of your ability before you send it out. Bad grammar and poor spelling can undermine a masterpiece! My husband and I like to go “rving” which is camping with a “house” instead of a tent! I also love to read. The plays are written for elementary school classroom students, grades 1-4. Each child has at least one line in the play. They are all musicals, although they use suggested popular songs and nursery rhyme songs which can be selected by the teacher or music teacher. Most of the plays are co-authored by my daughter, Kerry Gallagher. The plays have had several performances each, both in the United States and in the United Kingdom! Have You Seen My Little Lamb? – Mary has brought her lamb to school and now the lamb is lost. Mary, with the help of Mother Goose, meets many storybook friends as she searches for her lost lamb. The King’s Spell – Something is not right in Mother Goose Land, when Old King Cole casts a spell on the characters. Mother Goose wanders through the kingdom finding everything mixed up until she can prevail upon the King to remove his spell. When You Wish Upon a Star…fish – A little girl (or a little boy) finds a starfish while she is walking on the boardwalk and throws it back while making a wish that she could see what is under the sea. The play continues with the starfish introducing the little girl to different sea creatures, who each tell her a little about themselves. This play is educational in nature, and can easily be used in connection with a classroom project about undersea life. The Wonderful World of Weather – A bird family starts the play, which continues through the different weather scenarios as they go through the seasons, and the bird family concludes the play returning to their nest at home. This play is educational in nature, and can easily be used in connection with a classroom project about the weather. A couple more plays have been submitted as well. Please stay tuned to my website for updates! What “Made It” moments have you experienced in life? I have always been an “over-achiever” and have had many “made it” moments in my life, including celebrating our 51th wedding anniversary in June. Recently, the joy of receiving seven 2011 Awards for my three books! Pam Dlugos • I received three great AWARD winning books from author Sherrill S. Cannon that are nicely illustrated by Kalpart Team. Each is written in rhyme. “The Magic Word” and “Peter and The Whimper-Whineys” both demonstrate the value of good manners in fun and creative ways. And my personal favorite is “Santa’s Birthday Gift”. This delightful book cleverly and wondrously weaves the tradition of Santa into the religious story of Christ’s birth. It is no wonder all three of Sherrill’s books have won awards, her work is truly notable. I am honored to have been named the December Author of the Month by SBPRA! Thank you SBPRA!! 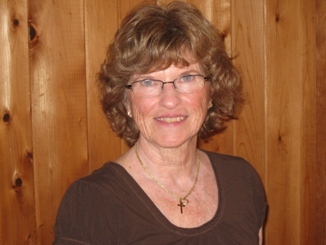 This month our featured author just has to be Sherrill S. Cannon. The author of three rhyming children’s books (Santa’s Birthday Gift, The Magic Word, Peter and the Whimper-Whineys), Sherrill is not only an accomplished writer but a consummate marketer of her work, with over 2,000 units sold as of November. This year the three picture books won SEVEN National Awards. Understanding the importance of technology, this year also saw Sherrill turn her print books into multi-format ebooks and Peter and the Whimper-Whineys became an interactive App available for download from the iTunes App Store. Through her dogged efforts, Santa’s Birthday Gift was stocked at the Washington National Cathedral Store in time for the holiday season, and has been on the best seller list on Amazon for the last several weeks, ranking under 10K overall regularly. It is featured on the “Red Room” website and part of their ‘blog your favorite Christmas story’ book giveaway. Cannon is also the featured author on the “What’s Up Sippy Cup?” site this month (as she says, “Don’t laugh”). She was just interviewed on WVIA radio (Wilkes-Barre, Scranton, PA) about her life and work (podcast – http://wviatv.org/radio/wvia-fm-programs/artscene) as well as on the website “Wild About Reading” (http://donalisahelsley.blogspot.com/2011/12/interview-with-sherrill-cannon-author.html). Realizing the scope of the growing global market, Sherrill has participated in every Book Expo SBPRA has attended , from Frankfurt to Beijing, and plans to do so in 2012 too! Congratulations, Sherrill; while not yet Dr. Seuss, you certainly are making a name for yourself. 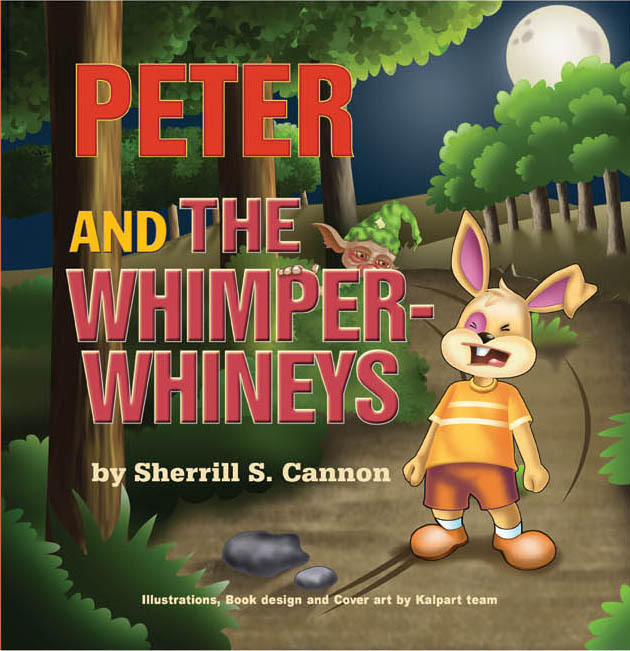 12/15 Donalisa Helsley gave 5 stars to: Peter and the Whimper-Whineys by Sherrill S. CannonPeter and the Whimper-Whineys is the story of a young whiney, “selfish and cranky and cross,” rabbit. After receiving a punishment he falls asleep and finds himself in the Whimper-Whineyland. He learns what the whimper whineys sound like to those around him. This story teaches having a positive attitude even when things do not go your way. Also that whiney is not the way to get attention or what you want. This book is a must for parents and teachers everywhere! The illustrations are cute and colorful. 12/15 Donalisa Helsley gave 5 stars to: The Magic Word by Sherrill S. CannonThe Magic Word is a wonderful tale that teaches manners. The words “please” and “thank you” are the magic words. Elisabeth is a very rude child who learns from her mother the lesson of common courtesy. She also learns how to be a good friend. This rhyming story flows from beginning to end. This is a great read aloud for little ones with beautiful illustrations to keep their attention. 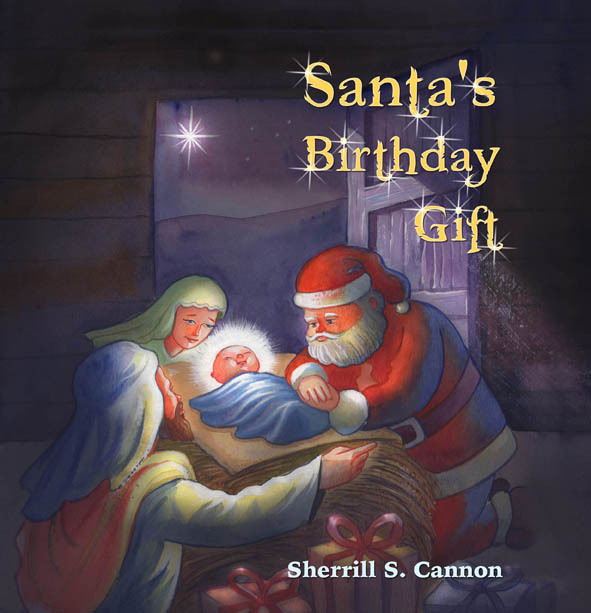 12/15 Donalisa Helsley gave 5 stars to: Santa’s Birthday Gift by Sherrill S. CannonI love the way Santa’s Birthday Gift ties the stories of Jesus and Santa Claus together. In my family we know Christmas is about the birth of Jesus but the kids also anxiously await to see what Santa brought them. This adorable rhyming story shows Santa’s role in Jesus’ birthday. It also teaches the lesson of giving. This story is bound to become a Christmas tradition with its simple, but beautiful retelling of the nativity scene. What a wonderful way to teach your kids the true meaning of Christmas! Nice PR on the SBPRA Success Stories! Author Sherrill Cannon is keeping up her busy — and successful — schedule of promoting her work. Cannon’s three rhyming picture books have won SEVEN National Awards this year and Santa’s Birthday Gift is now available at the Washington National Cathedral Store! That was a long-time goal for her. Santa has also been on the best seller list on Amazon for the last several weeks, ranking under 10K overall regularly. It is also part of the “Taste & See” eBook just released by Lorilyn Roberts of the John 3:16 Network. And, Cannon is the featured author on the “What’s Up Sippy Cup?” site this month (as she says, “Don’t laugh”). She is also scheduled for a radio interview on WVIA (Wilkes-Barre, Scranton, PA area next Tuesday) followed by another Barnes & Noble book signing Dec 17th. No wonder Sherrill Cannon is one of SBPRA’s best selling authors. We salute and applaud her efforts! Santa’s Birthday Gift is a wonderfully crafted story that explains both the birth of Jesus and Santa Claus’ spirit of gift giving. The story is written with such skill that it becomes plausible that Santa could have been there that night and this is how he began his yearly trips to good boys and girls. If your children, or you, want to know how Santa’s reindeer can fly, this story explains how. Have you ever wondered how Santa’s bag is always full of toys, no matter how many he pulls out? I have and this story finally explained in a way that makes sense. Santa’s Birthday Gift does something I have never seen before. It combines the traditional story of Christmas with Santa. I am sure I am not the only parent to be asked how Santa fits in with Christmas. This book may provide an answer. The rhyming tale starts with the birth of Jesus in a Bethlehem stable. At the North Pole, ‘an angel named Santa Claus’ (who is toy maker) wakes to starlight, packs toys into a sack, hitches his reindeer and offers a prayer. The reindeer fly Santa Claus to the manger in Bethlehem where he offers his gifts and promises to deliver gifts each year in celebration of Christ’s birth. Former teacher Sherrill S. Cannon of Great Bend, Pennsylvania, has written three children’s books that have garnered prestigious awards in 2011. In less than two years, this award-winning grandmother of nine has had three books published and four children’s plays published, with a fourth book due out in 2012. The Magic Word won the 2011 NABE Pinnacle Achievement Award, Dan Poynter’s Global eBook Finalist Award and was the Gold Winner for Concept in the Readers Favorite Award. Santa’s Birthday Gift won the 2011 National Indie Excellence Finalist Award and was the Silver Winner in Fables for K-3rd Grade in the Readers Favorite Award. Peter and the Whimper-Whineys was the Bronze Winner in Fables for K-3rd Grade in the 2011 Readers Favorite Award. Thanks to Rhonda Fischer for posting reviews in such a prestigious location! Most of my reviews can be found on amazon.com and bn.com under the respective titles – and all the books have the look-inside-the-book feature on amazon so that you can read a few pages. 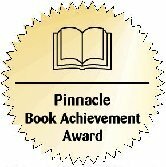 The Magic Word received a 2011 NABE Pinnacle Achievement Award as well as a 2011 Global eBook Finalist Award, Santas Birthday Gift received a 2011 National Indie Excellence Finalist Award, and all three books, including Peter and the Whimper-Whineys, are all winners in the 2011 Readers Favorite Awards. These award-winning titles from her publisher Strategic Book Group are now available as eBooks, and Peter and the Whimper-Whineys is also available as an app. I was unable to read your entire comment, but I agree that consideration for others is something that should be taught – especially by example – at an early age. That is the underlying message in my books, so that children can learn social skills disguised as fun stories. My next book, Gimme-Jimmy, has the same message – about how a bully learns to share. Looking at all your awards is very exciting. This site really shows what you’re made of. Strategic isn’t just on the ball, but they are fancy — goodlooking — awesome in their talents. This site glows, for you. My very best to you, always.